Meet my therapist and faithful friend. The Journal. Currently my therapist is a brown, perfect for traveling in my purse sized, Genuine Bonded Leather companion, made by C.R. Gibson under the name Markings. Perhaps I should call this current journal Mark for short. This is probably one of the favorites I have ever carried and it is durable, good looking and perfectly portable. Not too big, but not too small. That is key, after all. As far as journal companions go, right?. The right size is crucial. Today, I am bravely sharing from my current journal. The reason I am doing so is to share a few words on journaling in hopes of encouraging you to be ever more vigilant in your journaling journey! I hope to cover three basic points concerning the act of writing of all kinds. I randomly decided to call this the Writer’s Triad…for obvious reasons. Plus it just sounded cool. 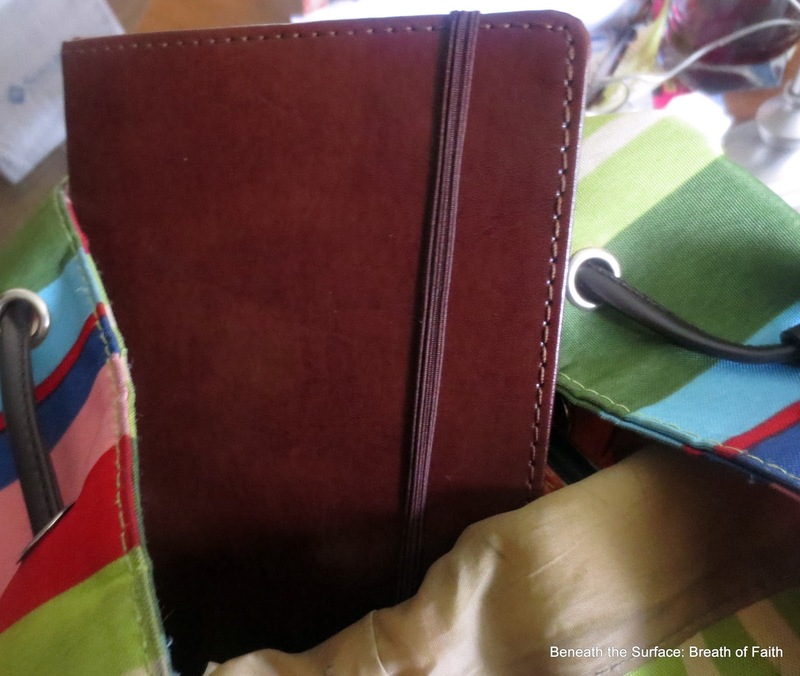 For me the act of writing anything, usually begins in my journal, so I will share a few thoughts on journal keeping and the power and possibilities therein. Secondly, I am no expert but I know what it is like to have to write something and feel the weight of pressure that blocks the mind, creativity and flowing words. The writer’s enemy across the board is Writer’s Block…but perhaps we can explore how it might be accepted as a gift, and see how this shift changes our perception, and ability to set words free again. Lastly, I believe the only thing potentially worse than dreaded Writer’s Block and deadly to creativity of all kinds is Perfectionism. I hope that my words today on these three areas will bring a fresh insight or two, or just a refreshing splash of inspiration to your writing life, wherever it is at this moment. I usually start my day writing. Every day. I grab my coffee and current journal, and on most days – not all- my Bible. During this time I am certainly not legalistic in my approach. I might read a few chapters in the Bible, or I might just sit, watching the birds, listening to the quiet as I rock gently, out back, in the veranda. There are days when I sit when words come easy, pouring forth from my pen after reading passages, listening, praying. Other days, I barely scratch out a line. But it is the showing up, day in and day out that pays off. There are days I need to ponder more deeply my words, revelations, thoughts. There are days I need to listen harder to that still small voice within. Oh and then there are days when busy-ness and life intrude. No worries, the Good Book and the Journal travel well. But if I have one, I carry my journal. The Word is engraved into my Heart, but my journal must be with me wherever I am. Just in case, I receive a word, need to vent (I go to the journal most times, not the phone, friends), need to feel the connection between myself and my God. Because for me the pen is my chariot, bringing me ever higher to the heavenlies. Even when it pours forth ugliness. Our hearts are more naked than we know, anyway. We are all ultimately laid bare. It is a worthy goal to have no pretense in living, and writing. The biggest thing about my journal keeping is it is where everything else in my life (especially creatively) more or less springboards. 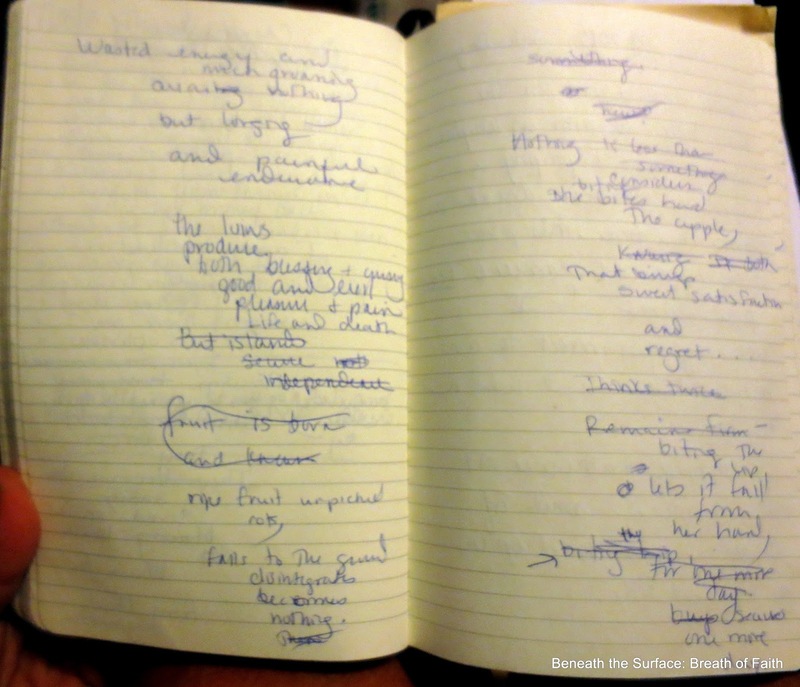 Prose for poetry, blog posts, and other writings are natural outflows of my journal writing time. I am not writing for audience when I journal but certainly what starts privately in my pages prompts most of what you see published by me here at some point. Sometimes I just scratch out a title, a thought, sentence or paragraph – randomly while journaling that gives rise to more. I scribble the idea seed on the page and return my mind to the prior writing entry before the little seed burst forth interrupting my train of thought. Is it my ADHD, or is it just the creative spark in action. Either way when you journal regularly, those seeds come. Which leads me to my next point…Writer’s Block and the writing life. This is how the poem The Apple looked in my journal as it flowed from one of my journal times. I like to share poems with the dVerse group on Tuesdays but also would like to publish my unpublished poems at some point. I know I could improve greatly…but it is a journey I am willing to pursue, as God leads, in His time. OH MY! It does not get more real than toothpaste, right? Deadlines. To Do’s. They either make you swoon with anticipation or slow your every ounce of creativity to a torturous drip, drip, drip. It’s one thing to write when you are excited about the topic, but what if you have to write for a deadline, for money or commitment. I can’t speak to the writing for cash (I am willing write for cash FYI) but for a scant job or two many years ago. I wrote a poem for a jewelry company about birthstones for a pittance. So, my experience is too little to speak on that fairly. Of course the dreaded endless papers written for college and presentations are another issue. The word deadline can be the kiss of life or death for creativity, right? But here is my two cents…my pittance, if you will. Because I write in my journal so frequently, my richest times of creativity flow are already poured out. Often when I feel dry, I just look back and pull from my more fluid days of writing. Guess what that does…it surprises me and releases me from the clamp of Writer’s Block because obviously, I can see I had a plethora (love that word!) of ideas, and ramblings just awhile back. Perspective is important for the days when you feel the impending deadline coming and stare at the computer screen or blank page as a deer staring into the headlights. You know what’s coming but you just can’t move. Well, get out of the road and read your old stuff. For a real shocker, read some of your college papers. Or old journals, secret hidden writings, blog posts etc. Read your own writing. It will do more for you than reading anyone else’s. Before you conclude I am an eccentric egomaniac, I hope to assure you, I am. No, just kidding. I read myself, because I am real in my journals…and I need to remember who I am, warts and all when I am in the desert with my writing. Or afraid I can’t make or live up to the deadline! I also see how my writing has changed, grown. I like to edit my older writings. I catch things that I missed on previous edits and simultaneously, I am reminded that I am not a totally sucky writer. Hooray. The same is true for you. Will you try it and let me know, the next time you feel ready to choke your computer? No perfectionism here folks. Just a random line or two that I could not get off the ground. This is how I write for real. It can be a little frightening to decode at times. Actually this one. Um. No. But I may change my mind…someday. So you treated yourself to that pretty new journal. Yet when you look at the pages you want to try and well, ya know…be perfect. Sigh. Listen to me. Forget this being perfect crap. Go look in the mirror. Go! Now! Get a wooden spoon from the kitchen draw, and hit yourself Repeat to your reflection, “My messy is just fine, I don’t need to be perfect, or write perfectly, I just need to keep it real and the rest will flow.” Now see that fresh new journal page. See all the empty pages before you? I want you to grab a cup of coffee, take a big, sloppy, sip and let it trickle down the outside of the mug. DO NOT get a coaster or a napkin. Instead take it and set it in the corner of the first perfect page of your journal. Let it sit there for a minute. Now pick it up and have another sip and do whatever you want with the cup. See that stain? Good. Now you don’t have to worry anymore about how everything needs to be so perfect in your journal, writing or life. Life is messy. Let your writing reflect what is real. Whatever your message is, needs to be filtered by only one thing, your own authenticity. I mean, your messy, coffee stained, crooked life is the one that will keep you connected to who you really are beneath the surface. Your voice comes through beautifully when it’s a bit mussed up. Let all you write, create, just reflect the real you. Obviously your journal holds safely your musings before you polish and shine them up for the world to see. But, the more you allow yourself your journal space to hash it all out, the more powerful your authentic voice becomes publicly. 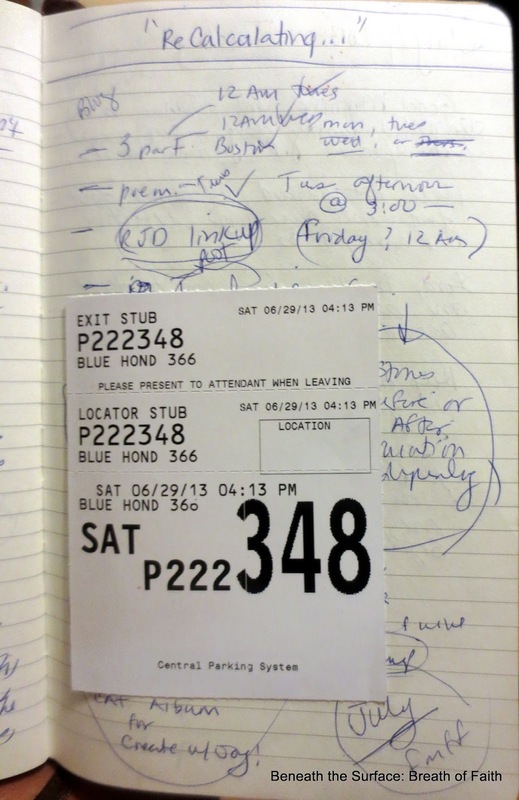 If you all remember my recent “One Night in Boston” posts- here are scribbles from the journal as I randomly planned upcoming posts AND our parking receipt. I stick paper mementos in my journal as well! Drawing is not my thing but occasionally I sketch things out. This is for an upcoming post.Maybe. Maybe not. I share less than 50% of what I have written. In conclusion, journaling helps me to pour my heart out and in this process I am able to redeem some things worthy of sharing. Remembering. We are all birds at the birdfeeder of life, yes? I know this is a long post. Not sure how many of you will make it to the end, but if you do, I pray it encouraged you in some way. Feel free to contact me if you have questions about journaling, journals or journal writing thoughts. Please join us this month for Random Journal Day Link up! love and blessings sweet friend. This was inspiring. Makes me want to start journaling all over again! Since I started writing my blog 3 years ago, (+), I haven't done the journaling thing like I used to. My blog has become my journal. But the difference is, now I'm writing with an audience in mind. Before the only audience was me and God…and those future grandchildren who may want to peek inside what made Grandma tick after I'm gone. Ha! I hope they care that much! Anyway, I think I am going to get back into the actual journaling again and save something for my progeny. This is good. I loved it. Thanks. VERY interesting, Dawn. 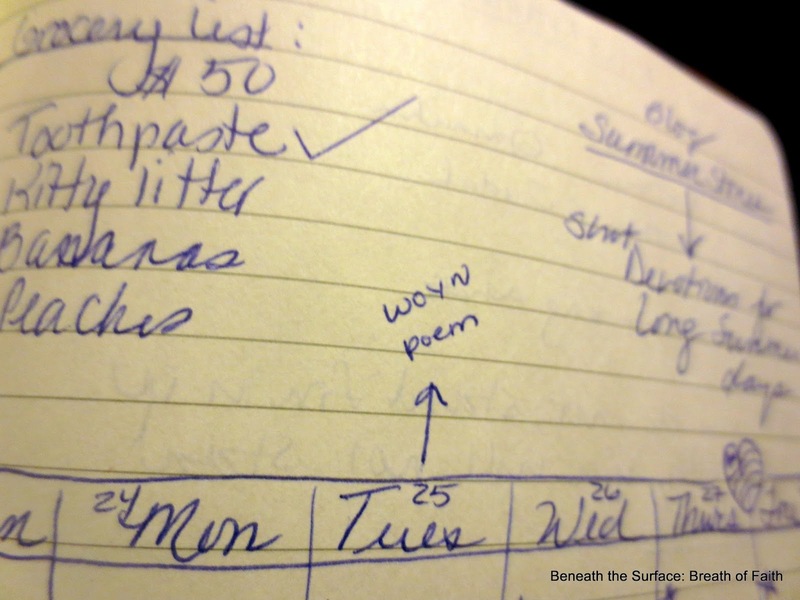 I, too, begin each day with my journal (and end it that way as well–can't imagine falling asleep without writing), but we have different processes. Maybe because I'm less a poet than you are. I edit less–for my blog as well. Maybe I should look into that. A long time ago I decided my journal was the place NOT to edit, just to let 'er rip, come what may, and edit away from those pages. So my unvarnished self lays bare in those blue notebooks, without censure. And that, I think, has been the key to it keeping me sane. 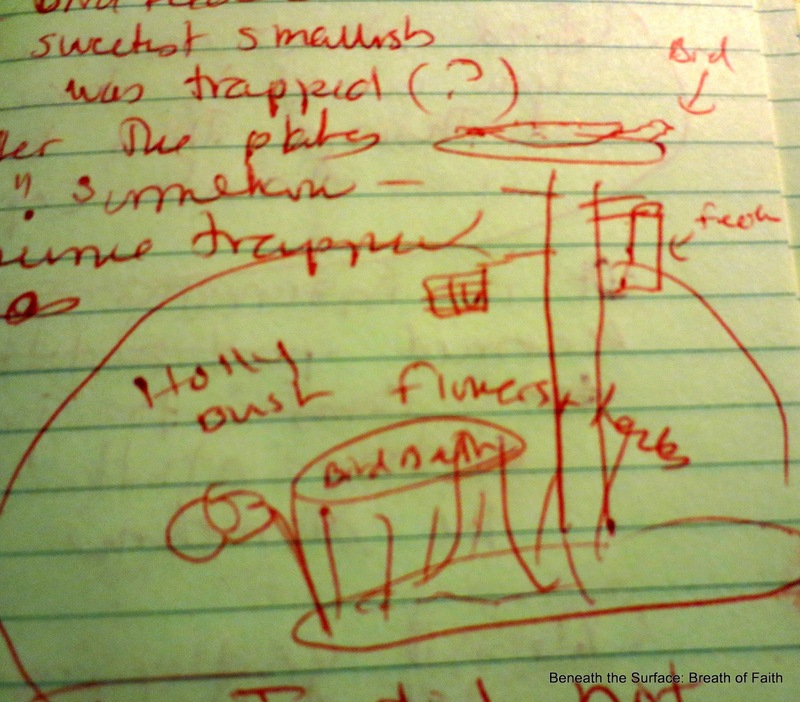 When I'm blocked in other writing, I go to the notebooks, and let it go. Every time. All this to say, you are helpful and thoughtful to young writers. And thanks for making this old dog (who's been a journal-keeper doing it one way for 45 years) think! 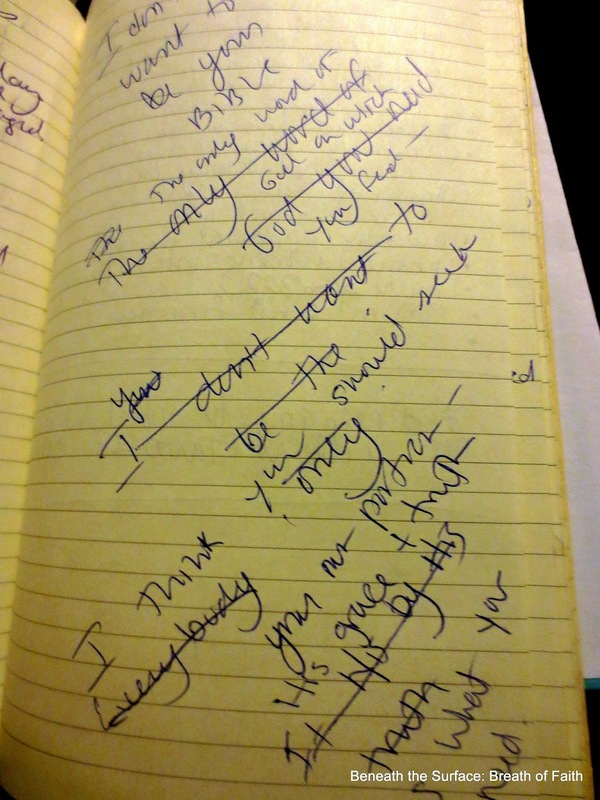 Oh, I never edit my journals, I will read back and make sure that is clear. I do edit old blog posts…if I see something in my journal that I want to share now (not for RJD day) then I will edit…if needful. I agree the point is to let loose in the journal and not hold back…come what may. Much of what I write does not belong here BUT so often out of the soil of my journal most if not all of my public writing is seeded, nourished, grown. I love your journals, my friend! I love the way you always keep the same kind. I am just way to random for that. But I appreciate the idea. I write randomly throughout the day as opportunity presents itself…hence carrying the journal with me. I wonder if I actually conveyed that clearly for this post or not! Happy RJD, C! OH, I hope you do, Pam. I find that I have to be very careful balancing my journal time writing with my blog post writing as I want to share as God leads. I can get carried away “performing” so I actually have to be very careful to be still and offer my writing to Him. SOmetimes He does not want me to run to the internet and share. He wants me to live what He shows me first. Or elaborate further. If I rush, I do not have His full revelation and am not surrendered to Him in my writing. I hope that does not sound to pious. Just have to remember He wants me to follow not lead in this realm. AT the least to be sensitive to HIs voice, in this time of many voices and words. He often wants me to hit pause and allow Him to clarify. That is the hard part for me. I am learning. SOmetimes He just wants me to write for His eyes only…and so I do. Love you, my friend! Hello sunshine! Praying your weekend is blessed! Hope you are feeling well. SMiles , Denise! 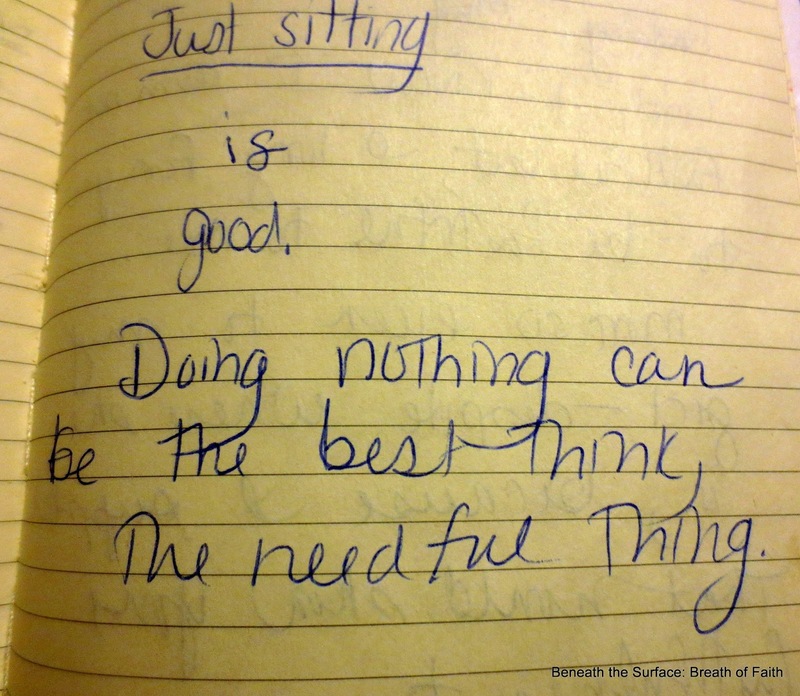 Journaling… big part of my life. Sometimes one line a day, sometimes 5 pages. Currently I have a journal that is not so pretty (just a 99ct store one) and I noticed that it is less fun to pick it up and write 🙂 Hhmmm, maybe I need a Mark like yours …. Dawn- This is one post that I am going to print out and add to my journal file to use to encourage others to journal! And write! You hit so many nails on the head with this post! Summer has taken me away from daily blogging, but I am so glad to have these monthly meet-ups…I see a theme of being real and living out our faith authentically with this months comments and links! Thanks for offering us this place to connect! Hugs! I would LOVE to see you here, anytime you can, Marja! Your words bless- I am sure your journals hold beautiful insights! Janis, what a blessing to hear! Will visit and follow – on my way- playing catch up! Thanks for the visit!